As big of a fan of the Puppet Bike as I am, I certainly don’t want to stand around in this kind of weather watching happy dancing cats. 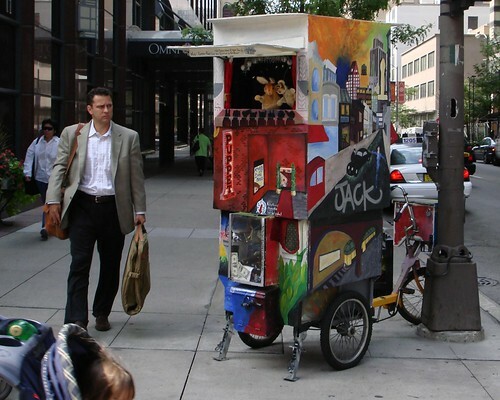 So it’s fortunate that the Puppet Bike’s Fifth Anniversary is being celebrated inside with 5 days of activities — art work from the puppeteers, bands, speeches, and puppet performances. Wednesday, Feb 20 – Sunday, Feb 24 at the Peter Jones Gallery, 1806 West Cuyler, 2nd floor, Chicago. Is this one of those bozos who block public traffic on the sidewalks? At least now the puppeteer will be inside and in a proper venue. If you can’t walk around a tiny puppet theater, dare I say it is thee who are the bozo!